Apart from tension or stress headaches there are some other types of headaches that are quite common. Sinus headaches and migraines are probably the next most common types, although migraines cannot really be classified as headaches as this would be an over simplification. Migraines are a lot more severe, and the experience of a migraine is not comparable to the normal headache. Sinus headaches, which are the other common phenomenon, are triggered due to blockages of the sinus passages that create a buildup of pressure and also due to infections of the sinus like sinusitis. Cluster headaches are another type of headache that is not uncommon. Headaches in children are again not something out of the ordinary and could have similar causes, but if persistent, severe or unresponsive to treatment should be given medical attention promptly. Under normal circumstances however mild natural headache treatments should suffice for headaches in children. When dealing with headaches in children always check the forehead in case of a fever and seek medical advice promptly if there is any vomiting. Headache treatment no matter what the cause or type of headache can however best be remedied through simple lifestyle changes and relaxation. If you have persistent headaches that do not respond to treatment, make sure you consult your health care provider. A sudden onset of severe or recurrent headaches could also be indicative of some serious health disorder, or if accompanied by other symptoms like nausea, stiff neck, disorientation, fever or ear and eye pain. Headaches that occur following trauma to the head should also receive medical attention. Chronic headaches should always be treated seriously, particularly in children as chronic headaches would have some underlying causes that may be serious and treatment should be directed towards these causes, not simply for relief. Headache cures are the most sought after remedies as it is one of the most common ailment people suffer from. Headaches afflict almost everyone at some time or the other. Most headaches are functional, being caused by temporary upsets, and are not related to any organic changes in the brain. They are often natures warning that something is wrong somewhere in the body. The actual pain, however, arises from irritation to nerve endings in the shoulder, neck, and scalp muscles, and also in the smooth muscles encircling the blood vessels which severe these areas. Migraine headaches in an acute condition suffered by some patients and we have listed some useful information for them also. 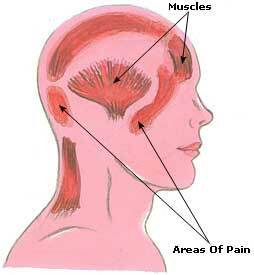 Tension or stress headaches usually cause pain that diffuses and is not concentrated in one identifiable spot. There is also likely to be tenderness in the surrounding areas and muscles. Here are some of the common symptoms associated with tension headaches. • Tension headaches tend to cause mild to moderate intensity pain. • Typically headaches like these do not develop suddenly, but there is a gradual build up of pain. There is however no warning or prodrome prior to the actual onset of the headache. • The pain could radiate from one side of the head or it may be present on both sides. It could cause an aching and squeezing sensation in the forehead or temples, or towards the back of the head. Headaches occurring towards the back of the head will generally radiate down towards the neck and the shoulders. There is a general feeling of tightness around the head. • The pain from a headache is usually constant, although there may fluctuations in the severity. • Tension headaches are usually not intensified with physical activity, nor is there any association with nausea or vomiting. • In some cases there may a slightly increased sensitivity to visual and audio stimuli. • You are also likely to experience a sensation of pressure behind the eyes. • Headaches of this type often come on during the day and progressively worsen, lasting for a few hours. Cluster headaches are characterized by excruciating pain that may be localized around one eye, producing a stabbing sensation. Tearing and nasal congestion are also likely to occur on the same side as the affected eye. Cluster headaches may just last for a quarter of an hour or for as long as four hours. There is also a high possibility of them recurring through the day. Smoking and excessive alcohol consumption is likely to influence or trigger cluster headaches. Migraines on the other hand cause an intense throbbing pain that may be felt on just one or both sides of the head. The pain from a migraine generally is accompanied by other symptoms like nausea and vomiting. Blurring of vision is another common symptom of headaches in a migraine attack. Light, sound and movement can cause the symptoms to be severely aggravated. Migraines may be brought on by specific triggers like red wine, chocolate, cheese, heat or other factors, often not easy to identify. For many women menstrual cycles may influence the pattern of migraines and they can also be brought on because of the influence of oral contraceptives and hormone replacement therapy. The common causes of headaches are allergy, emotional stress, eye strain, high blood pressure, a hangover, infection, low blood sugar, nutritional deficiency, tension, and the presence of poisons and toxins in the body. Allergies are often the unsuspected cause of headaches. The foods to which some people are allergic and which can trigger headaches are milk and milk products, chocolate, chicken, liver, alcohol and strong cheese. Sneezing and diarrhoea are further indications of an allergy. There are several natural remedies for various types or headaches. The juice of three or four slices of lemon should be squeezed in a cup of tea and taken by the patient for treating this condition. It gives immediate relief. The crust of lemon, which is generally thrown away, has been found useful in headaches caused by heat. Lemon crusts should be pounded into a fine paste in a mortar and applied as plaster on the forehead. Applying the yellow, freshly pared-off rind of a lemon to each temple will also give relief. Apples are valuable in curing all types of headaches. After removing the upper rind and the inner hard portion of a ripe apple, it should be taken with a little salt every morning on an empty stomach in such cases. This should be continued for about a week. The flowers of henna have been found valuable in curing headaches caused by hot sun. The flowers should be rubbed in vinegar and applied over the forehead. This remedy will soon provide relief. Cinnamon is useful in headaches caused by exposure to cold air. A fine paste of this spice should be prepared by mixing it with water and it should be applied over the temples and forehead to obtain relief. The herb marjoram is beneficial in the treatment of a nervous headache. An infusion of the leaves is taken as a tea in the treatment of this disorder. The herb rosemary has been found valuable in headaches resulting from cold. A handful of this herb should be boiled in a litre of water and put in a mug. The head should be covered with a towel and the steam inhaled for as long as the patient can bear. This should be repeated till the headache is relieved. The best way to prevent headaches is to build up physical resistance through proper nutrition, physical exercise and positive thinking. As a first step, the patient should undertake a short fast, and take citrus fruit juices diluted with water every two hours from 8.00 a.m. to 8.00 p.m. daily. Thereafter, he should plan his diet in such a way as to put the least possible strain on the digestion. Breakfast may consist of fruits, both fresh and dried. Lunch may consist of protein foods. Starchy foods such as wholewheat bread, cereals, rice, or potatoes should be taken at dinner along with raw salads. Spices, condiments, sour buttermilk, and oily foodstuffs should be avoided. Drinking a glass of water (warm water in winter and cool water in summer), mixed with a teaspoon of honey first thing in the morning, is also a good remedy. Copious drinking of water throughout the day is also advised. Other helpful measures in the treatment of headaches are a cleansing enema with water temperature at 37 degree C, a cold throat pack, frequent applications of towels wrung out from very hot water to the back of the neck , a cold compress at 4.4 degree C to 15.6 degree C applied to the head and face, or an alternate spinal compress. Hot fomentations over the abdominal region just before retiring relieve headaches caused by stomach and liver upsets. Hot foot baths are also beneficial in the treatment of chronic headaches. The patient should keep his legs in a tub or bucket filled with hot water at a temperature of 40 degree C to 45 degree C for fifteen minutes every night before retiring. This treatment should be continued for two or three weeks. Yogic kriyas like jalneti and kunjal; pranayamas like anulomaviloma, shitali and sitkari; and asanas such as uttanpadasana, sarvangasana, paschimottanasana, halasana, and shavasana are also beneficial in the treatment of headaches.